Cover dry white beans with cold water by 2 inches in a large bowl and let soak for 8 – 12 hours. Drain in colander. Transfer strained beans into a 6 – 8 quart heavy pot. Add 8 cups of cold water, beef broth, tomato paste, onion, and 2 Tbsp finely chopped garlic. Bring to a boil. Place the celery, thyme, bay leaf, cloves, a couple of sprigs of parsley and whole peppercorns in a cheesecloth and tie into a bundle with string to make a bouquet garni. Add bouquet garni to boiling beans, then reduce heat and simmer uncovered until the beans are almost tender (about an hour). Stir in tomatoes with juice and simmer until beans are tender (about 15 minutes more), then turn off heat. Fry sausage slices in a separate skillet until brown on both sides. Add remaining 1 tsp salt and ¼ tsp pepper, stir to incorporate into cassoulet. 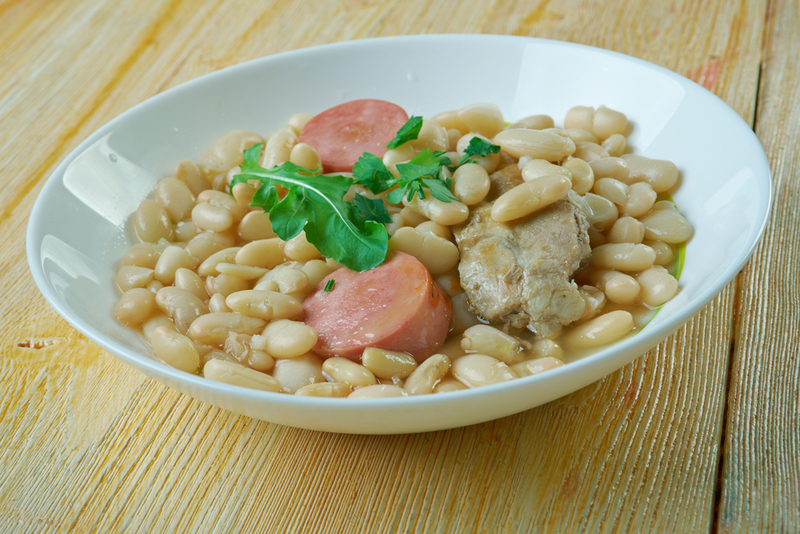 Ladle cassoulet into a casserole dish, layering the beans, then browned slices of garlic sausages and duck rillettes then more beans. Reserve enough sausage slices and duck to top the casserole mixture. (Meat and beans should be level with liquid; if they are submerged, ladle excess liquid back into pot and boil until reduced, then pour back into casserole dish). Make bread-crumb topping (options): Add remaining tablespoon chopped garlic to fat in a skillet and cook over medium heat, stirring for about 1 minute. Stir in fresh bread crumbs and cook, stirring until golden (about 2 minutes). Remove from heat and stir in chopped parsley, ½ tsp sea salt, ¼ tsp freshly ground pepper. NOTE:The Cassoulet can be assembled (but not baked) 1 day ahead of time. Cool the casserole before adding the topping, then top and chill in refrigerator, loosely covered. Let stand at room temperature 30 minutes before baking.